The entrance of the OPEC headquarters in Vienna. Photo: Bloomberg. London: Oil producer group OPEC is investing in new supplies to meet rising consumption, even as it sees the risk to the demand outlook is on the downside because of Europe’s sovereign debt crisis and slowing global economy. World oil demand is expected to rise to 92.9 million barrels per day (bpd) by 2015 in OPEC’s reference case presented in the report, up 1.9 million bpd from last year’s forecast. Actual oil demand averaged 86.8 million bpd in 2010. But the report cited an array of challenges for the global economy such as waning monetary stimulus, the euro zone debt crisis and signs that emerging countries -- expected to drive oil demand -- are not immune to worsening economic conditions. “All this has led to heightened downside risks for the world economy," OPEC secretary general Abdullah al-Badri wrote in an introduction to the 287-page annual report published on Tuesday. OPEC, which pumps more than a third of the world’s oil, is typically more conservative on oil demand than other forecasters such as the International Energy Agency. The IEA is due to issue its own long-term energy outlook on Wednesday. “It is worth stressing that risks appear skewed towards the downside, especially since the sovereign debt crisis in some EU countries seems to be spreading and the world economy slowing down further, with potential consequences for the global financial system," OPEC said. Increased political uncertainty in Italy, where Prime Minister Silvio Berlusconi is under pressure to resign, has added to turmoil in Europe from the Greek crisis, which has hit markets in recent weeks. OPEC’s report looks out to 2035, when it expects world oil demand to reach almost 110 million bpd in the reference case. Last year’s report stopped at 2030, when it foresaw demand of 106 million bpd. The report assumes an oil price of $85-$95 a barrel this decade, up from a $75-$85 assumption last year and below Tuesday’s session high of more than $116 for Brent crude. Oil reached a high so far in 2011 of $127 a barrel in April as the conflict in OPEC member Libya shut down its supplies. OPEC said speculators -- whom it often blames for influencing the market -- had exaggerated the impact of price moves earlier this year. Saudi Arabia and its Gulf OPEC allies raised production unilaterally after failing at the group’s last meeting in June to convince other members to agree a coordinated increase to meet the Libyan shortfall. 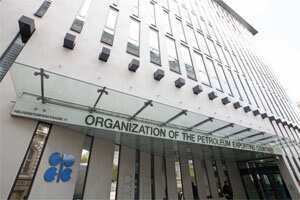 As a result, OPEC’s unused production capacity declined to about 4 million bpd for part of this year, the report said. OPEC estimated its spare capacity would double from that level and reach 8 million bpd in the medium term to 2015 as Libyan supply recovers and as a result of investments by other OPEC countries to expand output. The report said member countries had provided details of 132 projects they were planning from 2011-2015, which would result in investment close to $300 billion in that period if all the ventures are developed. “Regardless of all the challenges and uncertainties, OPEC member countries continue to invest in additional capacities," the report said. The report reiterated OPEC’s view that Libyan output would return to pre-war levels relatively quickly -- in 15 months or less. Libya produced 1.6 million bpd in January before the civil war. Supply is also expected to rise from countries outside OPEC, and the report saw demand for OPEC crude climbing slowly to 31.3 million bpd in 2015, up 500,000 bpd from last year’s forecast. OPEC has often made clear that carrying spare capacity can be a huge financial risk. The report stressed that producers were concerned about the impact on demand of consumer countries’ energy and climate policies. In another scenario in which a more rapid shift to hybrids and electric cars takes place, OPEC said world demand by 2035 would reach about 102 million bpd, curbing the need for extra OPEC oil. “By 2035, the amount of OPEC crude needed will be less than current levels", under that scenario, the report said. “This means that OPEC upstream investment requirements are subject to huge uncertainties."